This video will introduce you to adding images to the page and post formatting options. Paragraphs are a core part of successfully formatting content on your website. 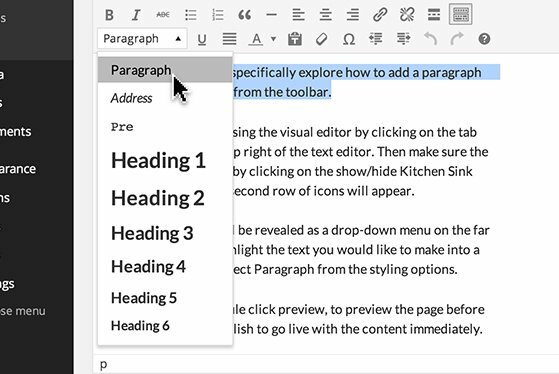 The ‘Paragraph’ styling option is listed with the other formatting options in the visual editor toolbar. To access the formatting drop-down be sure you are using the visual editor by clicking ‘Visual’ in the upper right-hand corner of the text editor. Click the ‘Toolbar Toggle’ option to reveal the second row of tools. The drop-down menu in the second row provides a robust set of formatting tools for controlling how content displays on your site. To set text as a paragraph, highlight the text you would like to format and choose ‘Paragraph’ from the menu. Once the content is formatted the way you want it to display, click ‘preview’ in the publish module to see what your content will look like when published, or click ‘Publish’ or ‘Update’ to make your content live. Introduce the formatting ‘Paragraph’ option to your users, clients and internal staff and take control over how content displays on your site.